I was involved in a traffic collision. Is there any way to view a recording of a traffic camera at a particular intersection? The City of Edmonton does not record any video footage from the traffic cameras. The video streams are intended to provide real-time traffic information for travelers. Why can’t I view the traffic cameras on my computer or mobile device? Mobile: The traffic camera website works on most mobile platforms. Please ensure that the latest operating system and browser are installed on your device. Unfortunately, the City of Edmonton is unable to investigate specific computer or mobile device problems. If you have reviewed the FAQ and are still experiencing problems, please contact your local internet service provider or retail store where the computer or device was purchased for assistance. One of the cameras appears to not be working correctly, or is displaying "This camera is currently unavailable". The traffic camera may be under regular maintenance or we are troubleshooting the problem. The cameras are monitored and checked each weekday, so reporting a problem with a specific camera is unnecessary. 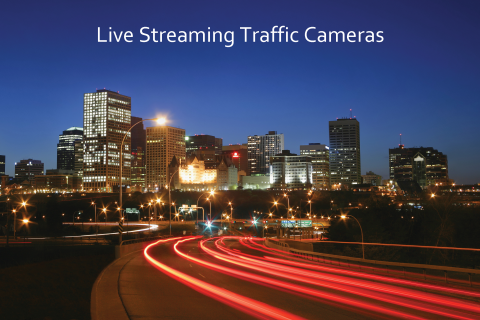 If a camera is being used by the Traffic Management Centre to manage traffic incidents (e.g. collisions), that camera will be temporarily unavailable to the public. Why can’t I select the view that I want to see by clicking on the typical views? The traffic cameras physically rotate through a series of views approximately every 30 seconds. The typical views cannot be selected and are provided only as a reference to help determine which view is currently being displayed. Can I request that the City install a traffic camera at a particular location? Traffic camera locations are not selected based on citizen requests. Locations are chosen to optimize their use in the Traffic Management Centre. I have a question about red light or speed-on-green (intersection safety) cameras.